I am running late with my weekly update on A Course in Miracles, and I don't want to skip it because a lot of exciting things happened last week. But first, let's talk about crystal balls! One of the first classes I signed up for at The College of Psychic Studies was a fun psychic exploration class with Michelle Hawcroft. This was in May of 2010, a few months before I started this blog. I was brand new to this magical world of spirit guides, angels, intuition and clairvoyance and every week was an adventure. I honestly loved all of the classes I took at the College, but Michelle's were probably the most fun. Michelle had us try a different tool every week, to test our Intuition. The ones that stand out were clairvoyant meditations where we went on a meditative journeys to meet our guides. Mine had long cloaks and initially I mistook them for monks, but eventually I also saw pointy hats and Dumbledore beards. Then one week, we practiced scrying with bowls of water - that was fun! Scrying is when you relax your mind and look into an object like a mirror, a crystal ball or even a bowl of water, and let your Intuition come in with images. Michelle made it easier for us by lighting candles and pouring melted wax into the water. The wax cools down very quickly when it touches cold water, making odd shapes in the process. We looked for images in the wax, trying to intuit the messages. When it was my turn to receive a reading, we saw three shapes in the wax: a star, a ballerina and a wizard! My classmates tuned into their intuition to get the meanings. The star represented my spirit guides and my connection with the Universe, the wizard was one of those guides, and the ballerina, well, you'll never guess! One of my classmates asked if I worked in theatre or performance art, was I a dancer? Nope, I was in marketing. She then asked if I was looking for a job (I was) and suggested I keep my mind open if someone approached me about a vacancy in music or dancing. She saw me "behind the scenes" doing something creative. At the time I worked in consumer marketing with a huge company and the thought of going to a theater never would have crossed my mind. I dismissed it. Two days later, I almost fell off my chair when a headhunter called to tell me about a marketing job with a music academy. My classmate was onto something! That little bowl of wax and water let us peer into the future, but in the end I made my own decision, accepting a new job at the company where I already worked. Since then I've been curious about scrying and for some reason, I really wanted a crystal ball even though I had no idea how to use one. 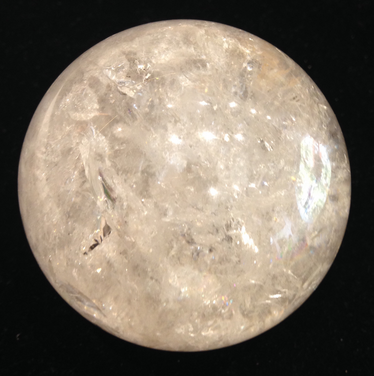 The past five years I've gone into every metaphysical shop looking for quartz spheres (I didn't want a glass ball) but it never felt like it was the right time to buy one. That and the fact that the crystals didn't speak to me. Fast forward five and a half years to last Tuesday. I was sitting in class listening to our teacher talk about A Course in Miracles and how we're learning to see things clearly, without any of the assumptions that we tend to project onto the world. I had a weird trippy moment where I started thinking about the Egyptian Goddess Isis, her son Horus and how the mythology tells us that he lost an eye avenging his father's death, and only after that loss, was he able to see clearly. An eye for an eye is a sad way to live our lives. That's how Horus lived his, until he lost his human sight and gained the spiritual gift of seeing with his heart instead (his real eye). I left class on Tuesday thinking that I wanted to see clearly for once. How could I boost my clairvoyance? On Thursday I had booked myself onto a quartz crystal workshop, one where we would learn how to connect with crystals, receive messages and use them for healing. I love crystals and I've read up on them but I still need practical experience, so this workshop was a Godsend. The teacher suggested that I bring a quartz point with me to class and I didn't have one, so I went looking. Don't ask me why, I put a certain amount of cash in my wallet and went shopping. The only metaphysical shop near my house is tiny, and they didn't have any quartz points - but they did have crystal balls! I saw a quartz sphere and it just spoke to me. The price was exactly what I had in my pocket. I went home with the crystal that same day and used Thursday's class to activate it. So Tuesday I had this Horus moment where I wanted to see clearly, Wednesday I found my quartz crystal ball, and Thursday I learned how to activate the crystal. I'm looking forward to meditating with this quartz sphere. For now, I just hold it in my hands and feel its energy. I wasn't expecting to see any images but I have. It almost feels like I'm holding a snow globe and when I shake it (energetically), the dust settles and I see a different picture in my mind's eye.